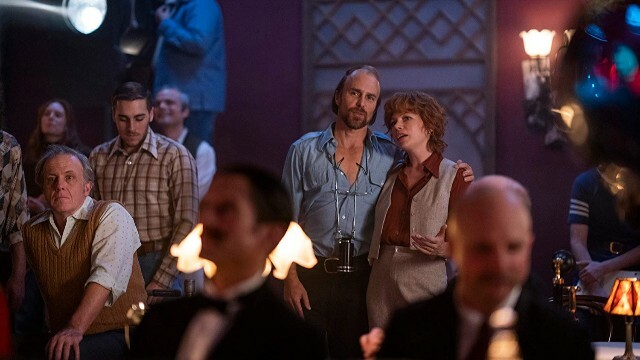 On Tuesday, April 9, FX debuted its latest limited series taking a look back into the annals of Hollywood history with Fosse/Verdon, which stars Oscar heavies Sam Rockwell and Michelle Williams. The series follows the tumultuous and triumphant relationship between famed director and choreographer Bob Fosses (Rockwell) and multi-hyphenate talent Gwen Verdon (Williams). The series begins with their meeting in the late 1960s while Fosse was directing the film adaptation of Sweet Charity, which Verdon had starred in when it was on Broadway (in real life, she was passed over for then-rising star Shirley MacLaine), and tracking the highs and lows of their professional collaboration and doomed marriage. Given that this series is based on two real people and tracks their lives over the course of events that really took place, we thought it would be fun to take a look at the premiere episode and see what the series gets right and wrong about key point in Fosse and Verdon’s early relationship. Rockwell and Williams’ chemistry in this re-telling of Fosse and Verdon’s lives together is electric, sure. But the real Fosse and Verdon are famously remembered for their near-supernatural connection, with some remarking there was almost a telepathic connection or understanding between them (one dancer told the New York Times in 1973 that “they read each other’s minds”) that allowed them to create beloved art. There’s a scene in the premiere of Fosse/Verdon that shows Fosse attempting to choreograph the “Big Spender” musical number in Sweet Charity, but with some difficulty; he can’t quite seem to convey to the dancers how he wants them to move or to act. Verdon comes up with the idea to tell the girls to think of the 10-cents-a-dance girls (an old school version of the modern-day lap dancer) and how dead on their feet they would probably be at the end of the night. Fosse and the dancers take to the suggestion like a moth to the flame. During the premiere, we see Fosse really working hard to secure directing the film version of Cabaret. To do this, he has to pitch moneyman Cy Feuer (played by Paul Reiser), who seems hesitant to secure Fosse because of differing visions (Feuer wants Cabaret to be an “intimate” movie but Fosse wants to put all the jazz and life possible into it). In reality, there was probably doubts about handing the reins over to Fosse because his film right before Cabaret, Sweet Charity, was a financial bomb, costing $20 million to make and only getting $8 million in return. The episode makes loose connections between Fosse’s harmful habits and his teenage years, when he worked as a dancer in strip clubs as a teenager in order to earn money for tap lessons. It’s been speculated that this situation gave root to Fosse’s simultaneous fear and adoration of women, mixing shame and pleasure together when it came to carnal things and later leading to various kinds of self-destructive behavior, something further reinforced by Fosse’s psychiatrist in later years. Late in the premiere episode, Verdon is called to Berlin to help Fosse on Cabaret. Shortly after arriving, Verdon realizes that what is needed is a gorilla mask, of all things, to help bring the number “If You Could See Her” to life. This really did happen and you can see the real Liza Minnelli, star of Cabaret, wearing the costume during the number. Fosse/Verdon airs every Tuesday on FX at 10/9c.